Paint Night on Friday, June 15 from 6-8 PM! - When Arts Collide co-sponsored by Our Revolution Malden and The Gallery. No art experience necessary, just a fun evening of creativity led by Debbie Corleto. Come to The Gallery at 480 Main St in Malden. Art materials and refreshments are included in the $40 fee. Get your tickets from Ari, 339-224-1437 Space is limited so don’t wait. BIG NIGHT for the ARTLine at Idle Hands Brewery will be held on Wednesday, June 20 from 6-9 pm at the taproom, 89 Commercial St. in Malden. Come sample the newest brew in the Idle Hands lineup--ARTLine Beer! Idle Hands will generously donate $1 per pint to the ARTLine. This is the final push before the June 28 deadline to raise the matching $27,000 and make the ARTLine eligible for the matching funds. Buy raffle tickets for local art, museum passes, gift baskets, and more delights. Meet award winning children's book author and illustrator Ed Emberey at the ribbon cutting of his mural and first stop on the ARTLine. 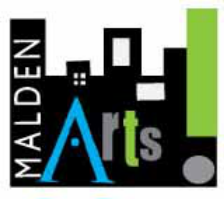 Join Malden Arts for a Silent Auction of local art and help raise funds for more murals in Malden.